It seems it is never too early to feel too old. A 38-year old thinks they are too old to leave their neglectful partner who ignores their interests. 27 year-old feels they missed their chance to take up tap dancing. A 23 year-old is too old to go quit their thankless job and try something new. A 56 year-old feels too old to take that trip they have always wanted to take. I have talked to teenagers who felt too old to take up hobbies, to 12 year-olds who told me they were too old to pick up instruments, to get on a skateboard, to “be good at school,” to do new things, to do things they used to do, to change. We foreclose. In an extension and slight bastardization of Erik Erikson’s identity theory, James Marcia defined identity foreclosure as the inability or unwillingness to consider options for being outside of those upon which sites are set. Marcia saw this as primarily an occupational state occupied by that those brought up to run the family business or told all their lives they will be a doctor. But foreclosure happens in other important parts of our identities commonly overlooked by those picking up his theory. We see ourselves certain ways and do what we can to resist cajoling invitations to try new things that might alter our paths. We feel we are who we are. On top of that, many of us don’t like to step on shaky ground, or to feel we are less-than-competent when people are watching us. We start to believe early on that we are this, not that. That’s just how it goes, we think. We stop trying things. We resist doing new things, and stop doing the things we once loved but no longer feel good enough to do. We foreclose. And, often, we do so because we feel we are too old. It goes on our whole lives. Not for Dottie Robinson. 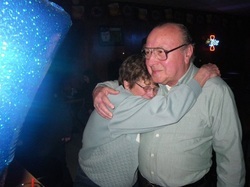 I knew Dottie as a longtime regular of the Brass Rail tavern downtown Champaign. 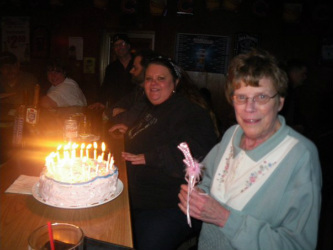 Up until a couple years ago, she could be found in her usual seat at the end of the bar that allowed her to look over her peppermint schnapps to see you walk in the door. Dottie was reserved but big-hearted. She was the girlfriend of Fote, the Brass Rail’s owner, and a mother twice-over from a relationship with a much lesser man. She retired from dry cleaning, and experienced the fall of the industry from one where she was considered a highly trained professional in the community to one where she was told to forget what she knew about quality to focus on moving product. And, as it turned out, she was a singer. Dottie grew up in town and had all types of stories. If she warmed up to you a lot, and if you didn’t let her off the hook, you would be treated to tales of playing the Rose Bowl in its hay day, when dancers from counties far away would converge every weekend to fill the dance floor, and where, for many years, Dottie was the only woman allowed on stage by then-owner Sonny Norman. You’d hear a little about ill-fraught romances kindling between locals, almost always to go bad. You’d find out about that one time as an early teenager when Dottie rode the Tilt-A-Whirl with Patsy Cline before opening for her at the State Fair (Patsy threw up). You’d hear about Dottie's performance at the Grand Ol’ Oprey and how a local radio personality paid to get her teeth straightened for the big show, about her weekend trips to the riverboat with her love Fote, about the Gibson Hummingbird she played in the Rovin' Gamblers that was damaged in a fire and borrowed by a family member who promised to give it back to her someday, and about Three Bs and a Honey, a band featuring Dottie, her B-named father, and his two B-named friends. If you asked enough questions and ordered enough schnapps, she might even tell you about how she married at 17 after years of performing and was told by her jealous husband to give up the stage to have a family. She might tell you how she complied then, and how she went back to performing when he left her five years later, only to give up singing again when her next husband, a guitarist, demanded the same thing. She might tell you how she hadn't set a foot back on stage since then. And she would tell you all of this with no anger or regret, wishing misfortune on no one. But she didn't tell me any of this for many years. When I first knew Dottie, I didn't ask too many questions or dig too deep. I saw hints early on, though, that, while an unassuming person most times, Dottie's slightness hid a deep fiery spirit. If you sat near her and said something she didn’t like for long enough, she would shoot you a look. If you brought it up again later on in the night, she might just tell you what she thought in pointed terms. Talk badly about a friend and Dottie would shut you down. Dottie was a quiet person, but she spoke her mind when it mattered. When she was set on something, there was no changing her. I grew to learn that she was stubborn and determined and loyal as they come. And although her speaking voice was breathy, when put toward singing, it rang of thunder and worn gravel, stopping rooms with its unapologeticness. Dottie had been out of the spotlight for 20 years when I took a seat next to her one winter night at the Brass Rail and, during a pause in our light conversation, heard her sing along with the jukebox to Harper Valley PTA . I knew Dottie for years at that point. She sat in the same spot at the bar throughout all of the loud shows I attended and played at "the ‘Rail," right next to Cecil, another kind longtime regular. During rare slower moments, Fote would join them, and the three would sit together giving serious attention to the bands, no matter how bad or screechy we were. I knew Dottie as a supportive, humble, no-nonsense person with a good sense of humor who liked Illini track jackets and shorts overalls. But this big, sassy voice from this little person at the end of the bar came as a surprise. “You have a great voice, Dottie,” I told her. “Did you ever sing?” “Oh, I sang in my day, dear,” she replied while sliding off her barstool to step outside for a smoke. Overhearing our conversation, the bartender leaned over the bar toward me. “Dottie was a player,” he said before giving me a quick run-down of some of her musical history. That night, at age 62, after patiently fielding many questions, Dottie accepted an offer from an enthusiastic guitarist who had never played a lick of country to allow me to try to get together a backing band that would get her back on stage. “Ok, dear,” she said to me with more than a hint of a “we’ll see” tone. 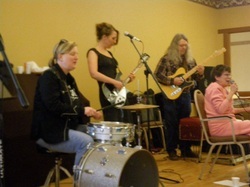 A few months later, after a few false starts, Dottie showed up for practice, and Dottie and the ‘Rail was born with Steve Burton on lead guitar, Dave Domal on drums, Bob Henne on bass, me on rhythm guitar, and Dottie on vocals. 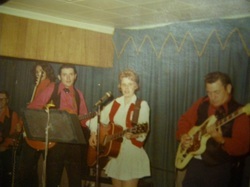 Dottie was a seasoned performer, but she had never had her own band when she agreed to sing the country songs she cherished in front of four rock musicians. 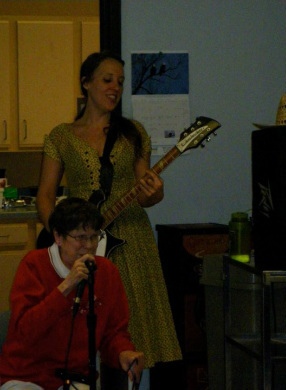 At 62, she started her own band. We hacked at Dottie’s beloved songs, and she sang on despite this. She got back on stage after not singing publicly for two decades to front country music novices, and to play for largely unfamiliar audiences. Her children never attended her shows. Most of her close friends were dead, far away, or not up late, she said. Still, she brought out crowds that filled the rooms at Mike n’ Molly’s, Cowboy Monkey, the Brass Rail, and the Highdive, where Dottie channeled Karen Carpenter one year for the Great Cover Up. We coordinated outfits behind her, but while Dottie would occasionally tolerate us costuming her a bit for the Cover Up and Halloween shows, she let her resonant voice speak for itself, taking the stage in pink jogging suits and Mickey Mouse sweatshirts, track jackets and jeans overalls. She was from a no-nonsense camp of crooners, choosing not to hide what she had behind flashy clothes, rhinestone glitz, and other fancy status-associated tropes. She didn’t dress it up. She just put out what she had and stood solidly behind it. Dottie always looked like such a tiny person to me at the bar, but when she got behind a mic, she expanded. She somehow grew larger, her shoulders thrown back, chin held high, back straight. Holding on to the mic stand, Dottie's voice bounced off walls sizzling with her fiery spirit, awoken and taking its place in the world where it knew it would shine. And it did. In 2010, Dottie took a bad fall that broke her pelvis, leaving her bedridden and in great pain. She had a long and difficult recovery period that launched rumors (probably by her) that her singing days were over. 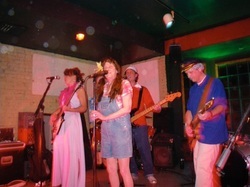 However, during this time, the band gained some seasoned country players, with Angie Heaton taking over on drums and Bob Watson, touring guitarist for Jeanie C. Riley of Harper Valley PTA fame, stepping in on lead. 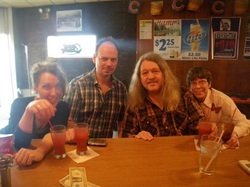 Dottie joined us for practice in the Rail one night saying she would listen, but could barely sit, let alone sing. By our second song, she had commandeered the microphone, unable to stand by silently as her songs were being played by Bob and Angie. The band was back in business. 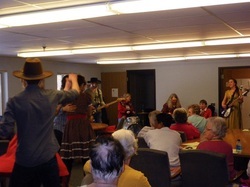 Soon after, Dottie and the ‘Rail wrote for a grant from the City of Urbana's Art Commission, which we used to put together a sing-along tour of low-income Urbana senior housing centers and nursing homes. We brought with us dancers who helped urge women with eager eyes out of their chairs and onto the dance floor (yes - residents were almost all women). We also brought along large-print lyric sheets that most kept for autographs, but did not need to reference. While the willing and able danced, all of the seniors sang along to Dottie’s first song Help me Make it Through the Night and on through the set, belting out Send me the Pillow that You Dream On, Stand By Your Man, Harper Valley PTA, and the others they learned by heart around the same time as Dottie. Dottie signed autographs at the end of each show and talked with audience members who remembered her singing with bands they used to dance to at the Rose Bowl. They raised names of musicians and friends who were no longer around to play or dance. 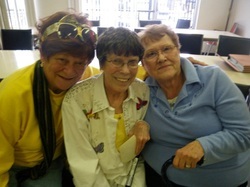 They talked about the songs she sang that day, and asked Dottie to promise to come back. Dottie made no such deals. On Thursday, May 22, 2014, Dottie refused to go along with plans to move her from the hospital where she had been receiving treatment to a nursing home. She was told she would be transferred the following day. Dottie passed away the morning of Friday, May 23, 2014. She was 68, and fiery and determined until the end. Dottie didn’t stop living because she thought she was too old. She didn’t fear going off course because she considered "those" days behind her. She sang although it required her to work with less talented collaborators than in her past, and although it took her away from her normal spaces and her familiar community. She didn’t foreclose. She kept right on living. So let's raise a peppermint schnapps to stink-eyeing the voices telling us we are too old to try or to do, too old to get back into the hot seat, too old to be seen or heard when we are used to sitting back. A toast to spending the energy that might go to regretting the past to trying to be more here in the present. To life, lived. To Dottie, who I have learned so much from. We will miss you. We do miss you, dear.